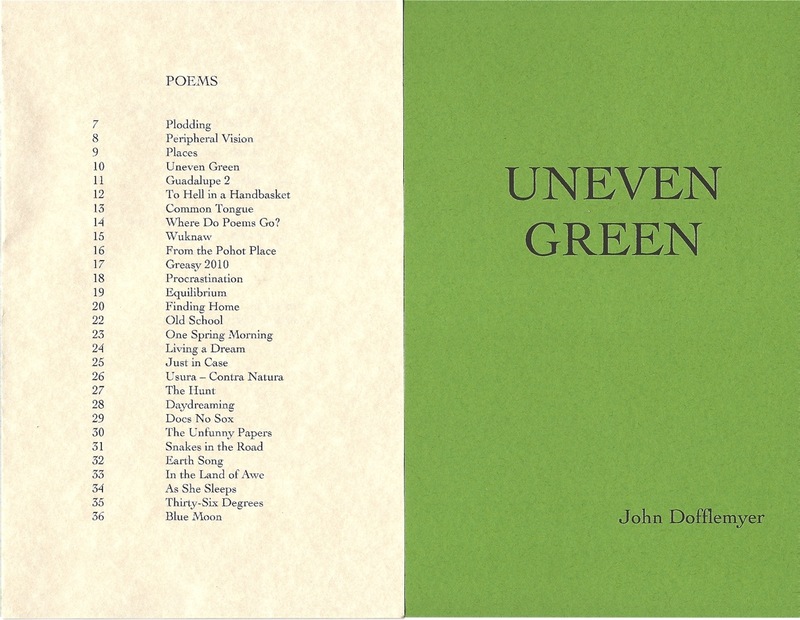 One of today’s most masterful Western poets, fifth-generation California rancher John Dofflemyer’s 2010 chapbook, UNEVEN GREEN, presents bold and organic observations and revelations. It is exceptional in the force of its vision and the contrast of the humility of its expression. The work of life, its pain and blessings, finds a steadfast place within the book’s covers. He writes of grief, including some elegies from a small, privately printed tribute to his mother. The emotion of those poems is never for grief’s sake. They are without sentimentality, told for what can be wrung from the experience of it, often going back to that effort of finding the way forward, again, the work of life. John Dofflemyer is planted deeply in the soil where his family settled soon after the Gold Rush. His work grows from the dirt and sweat of that land. It often gives the promise of what men, women, and life can be; what nature offers for that quest; and always, his words show how poetry can illuminate the way.